Stable runner Mr Fergus will compete on the Echuca Racing Club card on Monday, June 26 with nine events to be run racing on a current good (4). The single stable runner will see Mr Fergus having career start number three in the EMPD three-year-old maiden plate over 1400m, carrying a Super Vobis Bonus for qualified horses, Craig Newitt will ride jumping from barrier five with a field of 14 to compete. Mr Fergus has raced on two previous occasions for one placing earning prize money exceeding $3000. 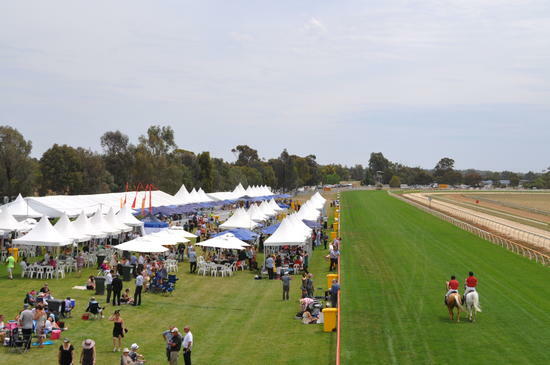 A 3-year-old Bay gelding by Street Boss out of Spur Reef he last presented himself at Wangaratta on June 6, finishing fifth of 12 with Craig Newitt the pilot landing 3.65 lengths behind Powers Lookout over the 1400m trip in a time of 1:27.15. Best of luck to connections with their runner at Echuca on Monday. By Train - Echuca is approximately 3 hours and 20 minutes from Melbourne's Southern Cross Station. Visitors can catch a train directly to Echuca, or alternatively can catch trains to Bendigo, Shepparton or Murchison East and catch a connecting coach to Echuca. By Bus & Coaches run from Southern Cross, Bendigo, Shepparton and Murchison East Visit VLine for timetables and further information.